KT better than AT when short stacked ??? I am currently studying Arnold Snyder's "Poker tournament formula". He is giving some preflop card charts, based on your stack. One of them seems very confusing to me. IMO AT is missing ! How can it be that KT is considered better than AT ??? I think that is just error, but may be there are some considerations that I'm missing ? Similar Threads for: KT better than AT when short stacked ??? Dont go off of his range charts. Arnold snyders book is good as an introduction. It was my first poker book and i learned a lot from it, but the game has evolved a lot since then and a lot of math has been done on hand ranges since then. And what about different actions based on: First in pot, After limpers, After raisers ? Yep haha, remember that jennifears push/fold ranges are only for open raising all in pre, if the pots been opened you havw to adjust accordingly. I haven't read the book. 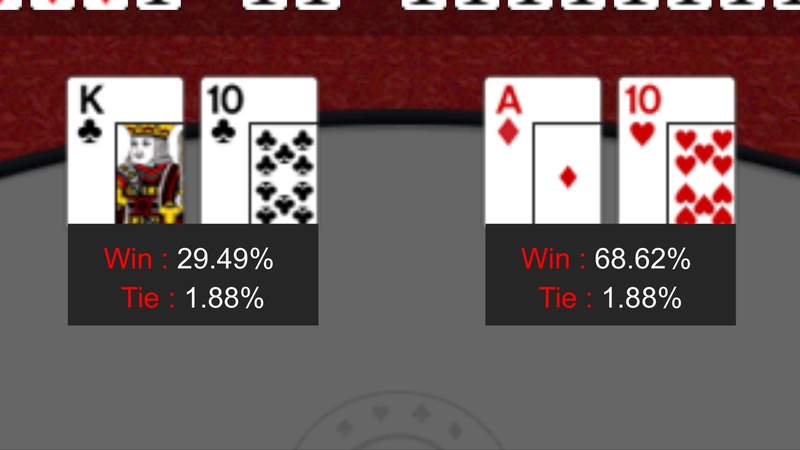 But AT vs. KT depends on the types of hands you expect will call the All In. re: Poker & KT better than AT when short stacked ??? OP is talking about short stack jamming, implying stacks are not big enough to just bet fold. I may be wrong, but that's my understanding of this thread. Anyway you don't really need a range to bluff shove....right. any 2 will work for that. There has to be something we are missing, like OP misread or it was a misprint?? Maybe since K10 is considered more live then dominated A10. As playinggames says, and my earlier post shows, KT is slightly stronger against a tight calling range that includes AQ. This would be even more true if we add AJ to that range. As mbrenneman says, short-stack shoves have become more common since this book was written, and the player pool has adjusted. So we might expect that calling ranges have generally become wider, including more Ax hands of AT or lower, and maybe KQ. This would make AT a more profitable shove than it used to be. If the shove is from late position, it becomes more player-dependent. I'd very slightly prefer shoving KT than AT from the button into two TAGs. I'd prefer shoving AT if there is a deep-stacked fish with a high VPIP yet to act. Practically speaking, there are not many situations where I would shove one but not the other. I think AT belongs on the list today, but the author's thinking is not unreasonable, especially for the time the book was written. and no, a bluff shove is not any two cards, bluff shoves should be evaluated mathematically for equity against a calling range in order to be considered profitable, what makes it a bluff is that the majority of the EV comes from fold equity rather than pot equity against a calling range. If you look at jennifears charts, each range suggested in the chart includes both value shoves (where the shove relies on pot equity to be profitable, these are the strong hands) and bluff shoves, these are the bottom of each range in jennifears chart and relies on fold equity. Yikes. In that case, I take back my idea that AT should be added to that list. It depends on players and position, but as a general recommendation, of course don't go around shoving AT or KT that deep. Ok so we are talking about live poker, not online since almost all online tournaments are turbo. Mbrenneman, I know you are very knowledgeable and in no way questioning your knowledge, and very much appreciate your explanation of bluff shoves. Now can you please explain a situation where you would shove KT and not AT. no i cant because its bad. im not justifying arnold snyder's strategy, im just explaining the context that it's in. Arnold's strategy is in the context of live poker tournaments in 2006. as i've explained, poker has evolved a lot since then, especially online and that his strategy advice, especially in short stack play, is no longer relevant. and OP should use jennifear's push/fold chart rather than the ranges arnold suggests. If you shove with K9 suited or better you are making profitable play generally speaking according to tournament legend Phil Hellmuth. did you miss the suited? for the reason that Suited brings about 2% more wining chance. there is no reason if shoving QJo no ATo, but there is a good reason that QJ listed here is QJs , so no ATo is correct. When is KTs better then ATo? look how far of a stretch A is from the ten. unless suited I fold A 10, but that's me. J 10 I fold unless I have a a good stack or they are suited. K-9 fold, q-8 fold, q-9 fold unless suited, again stack has to be good, and where I am in position. I'll play q 10 unsuited, but not if there's a raise that's more than twice the BB it's best to play pairs and hands with no more than 1 in the gap, like A-Q K-J Q-10 J-9 but again J-9 is a very weak hand. but some players will play every hand up to a 1 card gap all the way down to 5-7, start with the 10 best starting hands in Texas holdem" and you won't see A-10 I don't like playing an A-2,3,4,5 unless suited. A,6,7,8,9, are fold hands to for me. Playing very very tight had landed me on the final table so many times, when I hit the Final Table I still play tight, but I do get a little more loose. when down to a 3 people game, at times to low card will pair and give the win, or the high card. Just my thoughts and playing style.